If you wear contact lenses, proper cleaning and sanitation is essential. This is one reason why many people may be concerned about continuing to wear a contact lens that has fallen into a pool. Keep reading for more information about contact lens safety, especially concerning contact lenses in relation to pools, lakes and the ocean. The FDA recommends removing contact lenses before swimming. This is primarily due to the bacteria that may be present in swimming pools, hot tubs, lakes and the ocean. There are many different types of bacteria found in water and these bacteria can cause serious eye infections, sometimes leading to blindness. Removing your contact lenses before getting into the pool can help to limit exposure to these bacteria and can protect your eyes. One common organism found in pool water is called Acanthamoeba and causes corneal infections. In addition to bacteria being found in pool water, other contaminants may be present like parasites or amoebas. In August 2012 a young woman from the United Kingdom lost her eye sight in one eye after swimming in a hotel pool wearing contacts. It is believed that a parasite in the water was trapped in between the contact and her eye allowing it to burrow into her eyeball which led to blindness. It is very important to be aware of the risks of contact lenses, especially when you are around water. Chlorine acts as an antiseptic solution, killing bacteria in the water. 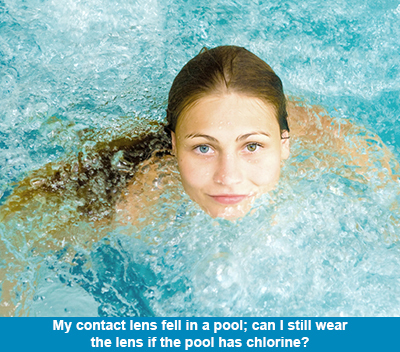 Chlorine isn’t really the issue when it comes to contact lenses and the pool. A much bigger issue is the risk of infection from being exposed to bacteria in the water. Will Contact Lenses Fall Out in the Pool? Many people worry that their contact lenses will fall out in the pool, but in actuality they typically attach more tightly to the eye than when not in water. Contact lenses will rarely fall out when in the pool, but due to the risk of infection should not be worn while swimming. If you wear gas permeable contact lenses, you are at an increased risk of losing a contact lens if you wear them while swimming. Soft contacts tend to adhere more tightly to the eye when exposed to water, but some other types of lenses do not. Proper care and cleaning is essential for keeping your contact lenses safe and ready to use. Contact lenses should only be cleaned using contact lens solution and cleaner, never water. This is to keep the lenses clean and bacteria free. Before cleaning a pair of contact lenses you should carefully wash your hands. This is to remove any bacteria that may be present on your hands. Each lens should be carefully cleaned following the instructions provided by your eye doctor, your contact lens manufacturer and the contact lens solution you are using. Some lenses may be able to be cleaned and still used after falling into a chlorinated pool while others should be thrown out. Your eye doctor will be able to provide the best information about the proper cleaning and care for your contact lenses. One way to protect your contacts from accidental exposure to pool water is to avoid wearing them around the pool. Since contact lenses shouldn’t be worn while swimming, wearing glasses near the pool will save you from ever having this problem again. Many eye doctors recommend wearing waterproof eye goggles if you want to wear contact lenses into the pool. While the safest choice is not wearing contacts at all while swimming, waterproof goggles can be an acceptable substitute if the proper precautions are taken. Since harmful bacteria can be present in water, it is important to keep your contacts away from exposure to water whether it be pool water, hot tub water, lake water, ocean water or even shower water. In addition it is important to keep your contact lenses clean and to only clean them with approved contact lens solution. Please see your eye doctor with any questions you may have about wearing your contacts near the pool. Another solution is to wear daily disposable contact lenses. They can be used as one time use and be disposed immediately after swimming. It is still best to use these daily disposable contact lenses in conjunction with goggles to help protect your eyes from the bacteria in the water.